Steps is what we got! A division of George R Roberts Co.
Also Rock A Round ! This is a four riser shown this time with pewter powder coated aluminum railings. This Big Boy blends beautifully with the onsite stonework that was added by the owner after the step was installed. This time with antique brick veneer and black powder coated steel railings. Also available with red brick and never rust aluminum rails. 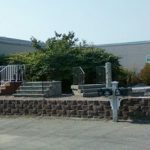 Available width from 4 ft to 8 ft. With the look of individual granite treds , it is solidly cast in one piece durability. Rockafella ingrade steps and sidewalks. The look of authentic New England granite at a fraction of the cost. Lots of people take us for Granite! In front of the background of an antique brick wall, this is a very classic New England look. Monolithic one piece casting ensures strength and durability. Note the false joints on the side of the step to add to the illusion of individual filler pieces. This step is cast in one piece up to five risers. Customized! Made to fit this home owners very unique rounded front porch. The unique radius feature of Rockaround compliments the soft curves of the existing landscaping. Under the watchful eye of the cherub, Zeb is complimented by precast concrete retaining walls with reel stone veneer to create multi level planting areas. 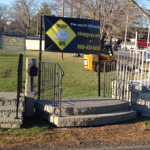 Step Guys is a division of George Roberts Co., one of New England’s leading suppliers of precast concrete products. From its start in 1962, the company built a strong reputation for its commercial and residential applications; including septic tanks, well tiles, and other drainage products. In 1998 we decided to shake up the stodgy old precast step world in New England and The Step Guys was born. We produced our first completely unique precast concrete step in 1999, the Rockafella. With a combination of Yankee ingenuity and hard work, we created a product that has proven to have many advantages over real granite, and it is so beautiful that lots of people take it for granite. But we didn’t stop there. In fact, some folks may think we’re a little eccentric because we’re so passionate about constantly improving our steps. That passion has made us the leading innovators of precast steps in New England. Since the Rockafella, we’ve added steps faced with real fieldstone and with brick. We also now make rounded steps. The Step Guys manufacture unique precast concrete steps. 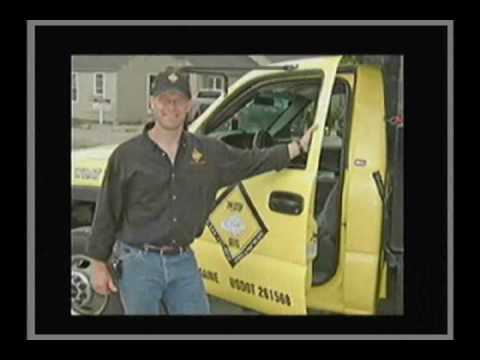 We install our steps in Maine, New Hampshire, and Massachusetts. We now have one display areas of our steps in Massachusetts for your convenience. This is a step display only. For further information after viewing steps please call us at 1-888-433-6010.